SAM’S SUMMER OF FUN! | 4 months postop! ← I am the bionic woman…. It has now begun to feel a long time since I could do all my pre-injury activities, and it seems to be quite slow progress still, but at least it is progress. Keep reminding myself I haven’t been out of the cast for as long as I was in it yet, so will be patient for a while longer! The rush hour commute took a bit of building up the confidence to try, with so many people charging around, but I usually meet a friend en route who will offer me an arm if I look a bit wobbly. So where am I otherwise? Well, still walking with a limp if I try to go too fast or am tired, but the length of time I can stand up for without feeling the heel pain is increasing. Still get heel pain after a while, physio says the plantar fascia is still very tight. I have my checkup with the surgeon on Friday so she will put that in the report to him - said they can offer an injection to relax it, but I really don’t fancy that idea at all! I’m more conscious of my posture and walking properly which is a good thing, and in less of a rush generally to go places - ‘cos I can’t. Have yet to try driving any distance, more from lack of time to have a proper go than any other reason. Working particularly on getting my knee further over my toes to enable my walking to improve and to be able to go downstairs properly, and also some weight-bearing exercises to strengthen the calf. Not a particularly exciting post, just slow steady progress again, but wanted to note the date. Aiming to be walking “normally” by Christmas. Best wishes to everyone out there. Great to hear from you again Sam. Glad that your progress continues unabated and that stamina is coming back. I think you are wise to be wary of an injection. How long did it take to get your first PT appointment? - Portsmouth NHS Trust has just told me they can fit me in on December 21st for my first PT session, after I stamped my feet (not literally!) they are going to fit me in 16th Nov (this will be just over 14 weeks from injury). Hi Sam, What is your AT/Ankle flexibility like now on your bad leg compared to good? I have same problems with knee not being able to bend since AT still not stretched enough yet.. good to see you working on good walking posture..
Hi Chris - The NHS misdiagnosed me so I used my husband’s private health cover from work and got physio the same day I got out of the cast. I’ve heard other people having to wait a long time for physio on the NHS, if you didn’t have one in a few weeks I would have suggested stumping up the cash for a couple of private sessions to make sure you’re doing the right things. The massage and manipulation is great (if a little painful sometimes!) and always good to have professional advice on how far to push things. Good luck. Hi tedb - the flexibility is still not quite as good in my injured leg as the good one, but getting pretty close. 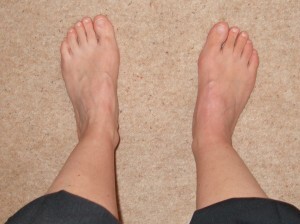 Feels to me it’s more the front of the ankle that is restricting me rather than the tendon, although that gets tight when I do a good stretch. Seeing the surgeon on Friday so will try to ask more about that then. Physio today said there is some tone returning to my calf (not quite sure where?!) and thought it was a combination of the tendon and the tight plantar fascia restricting my flexibility. She also thinks the cast may have been a bit tight around the ankle, so will take some time to regain full flexibility. Sam, good to hear you are progressing. I am just starting my 4th month post op (2nd time) I think the picture look pretty good. Keep up the effort, it will pay off. Thanks dalezink - have just found your blog and posted there. Hi Sam, I am glad to hear things are going well for you, too. Thanks tdb, I have been doing some of them, but not the last one, will try that as well - difficult to fit all the exercies in life has gone back to “normal” in every other way (work, study, family, house……). Hi 2ndtimer, hope all is continuing well for you. I’ve always heard that about North-Americans…but wasn’t sure it was really true! I have got a folding walking stick but find it more difficult to walk properly with it than without it. Hi 2ndtimer - it can be like that in some more rural areas of the UK too. Quite lucky to have good bus/rail connections here in Greater London, although we all complain about it at times! Injured during: School sports day race! sam66 has completed the grueling 26.2 ATR miles to full recovery!